KFC t20 Big Bash League is a T20 tournament conducted in Australia and administrated by Cricket Australia. There will be 8 teams playing in KFC t20 Big Bash League 2011-2012. KFC t20 Big Bash League is also a way to the Champions League Twenty20 tournament where 2 top teams will qualify for Champions League Twenty20 tournament. There will be total 31 teams playing in Big Bash League 2011–12. The starting date of Big Bash League 2011–12 is from 16th December 2011 and ends in 28th January 2012.Big Bash League is a T20 cricket tournament of Australia which is conducted every year from the year 2005. There will be group stages and knock out matches in Big Bash League 2011–12. 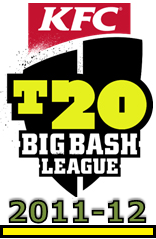 More details about the teams and fixtures for Big Bash League 2011–12 are given below. There will be 8 teams participating in Big Bash League 2011–12. All 8 teams are from Australia who is t20 experts. Players from other countries apart from Australia will be played in the tournament. There will be two international players playing in each team. More details about the teams and their captains are given below. Eight teams will compete each other in group stages and four teams will enter into semi finals and finals. Four teams with most points will reach semi finals. More details about the schedule for Big Bash League 2011–12 are given below. Both Indian and Australian timings are given in the fixture.